Construction on the Expeditionary Sea Base damaged when its dry dock flooded in July is expected to be delayed at least six months and the Navy anticipates being asked to foot the repair bill, officials told USNI News. The under-construction Miguel Keith (ESB-5) flooded from the fourth deck on down, resulting in roughly 1,600 different pieces of equipment being completely submerged, Capt. Scot Searles, the Navy’s program manager for Expeditionary Transport told USNI News on Wednesday. At the time of the flooding, Miguel Keith was in a graving dock at the General Dynamics National Steel and Shipbuilding Company (GD-NASSCO) shipyard in San Diego. Large sections of the hull were cut open to allow workers and equipment easy access to the ship’s interior. “We’re going through the process of assessing items if it can be repaired or needs to be replaced,” Searles told USNI News. The Navy, NASSCO and vendors are evaluating the damage to the ship and calculating repair costs. Final estimates will likely be submitted by year’s end, but the ship will likely be six months behind schedule, Searles said. Construction of the ship has resumed, even as final estimates for replacement parts and repair work are ordered, Dennis DuBard, a NASSCO spokesman told USNI News on Thursday. Less clear is who will pay for the repairs and what the delays will do to NASSCO’s workflow, and the bottom line of parent company General Dynamics. After the incident occurred, NASSCO laid-off nearly 200 workers while evaluating Miguel Keith and preparing the hull for repairs. As of Thursday, all but seven of the laid-off workers were back at work at NASSCO, DuBard said. Top executives from General Dynamics are scheduled to discuss third quarter financial results with Wall Street analysts on Wednesday. A final cost estimate for repairs is expected to be finished by year’s end, Searles said. 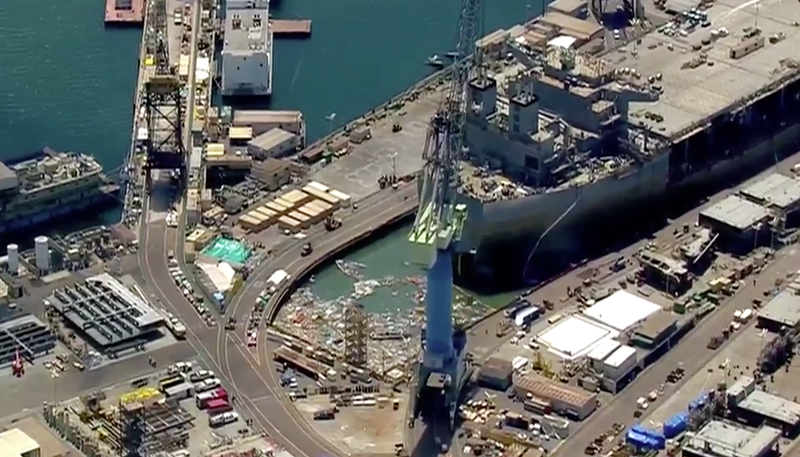 The Navy and NASSCO still need to hear from vendors about the cost of repairing and replacing parts, and the cost of any rigging or other supports equipment needed to do the work. Once a final cost estimate is created, Searles said NASSCO can file a claim with the Navy to be reimbursed for its work. The Navy self-insures such large-scale projects, so if NASSCO’s claim is approved, the Navy ends up paying for the repairs. While some of Miguel Keith’s ruined components are relatively small and easy to replace, others units are quite large and require significant amounts of lead time for vendors. The General Electric-built propulsion unit was submerged and the ship’s shafts and bow thrusters were damaged when the hull was knocked off its docking blocks as the dock flooded, Searles said. The Navy, NASSCO and vendors are still determining if these units can be salvaged or need to be replaced. NASSCO, Searles added, has been very helpful, bringing in workers from its repair business to assess the damage. To replace equipment, the Navy will have to place orders with suppliers, which could further delay the ship’s completion. The propulsion unit, shafts or bow thrusters are not the sort of off-the-shelf parts stored in a warehouse. Replacements will need to be manufactured, requiring vendors to schedule new work-orders into their production schedules. “We’re probably two-thirds to three-fourths of the way through with all the vendors,” Searles said.